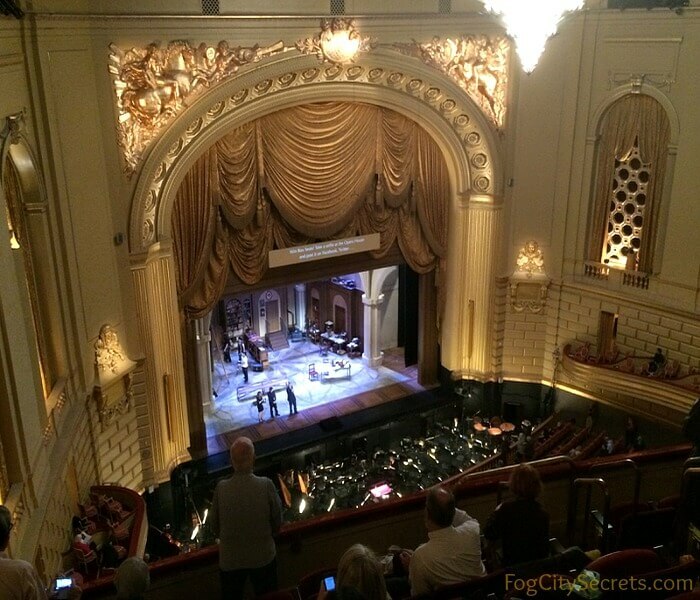 A Night at the SF Opera; beauty, magic and music. Forget reality TV; the SF Opera has better drama, tears, betrayals and passion! 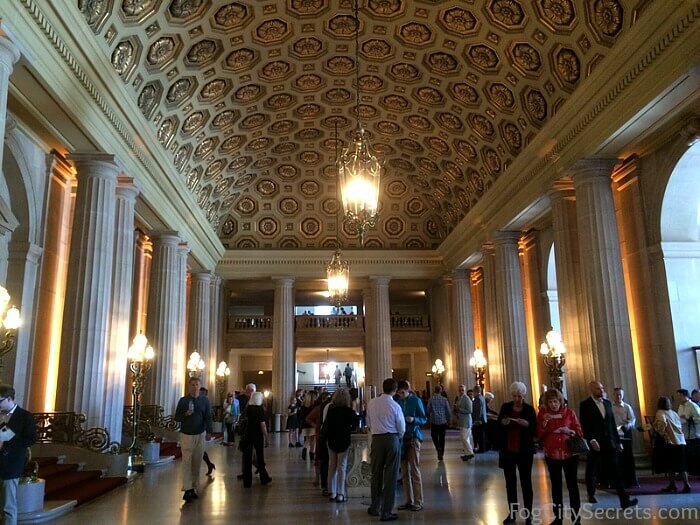 Read on, for a local's tips on visiting the San Francisco Opera and having a great night out. 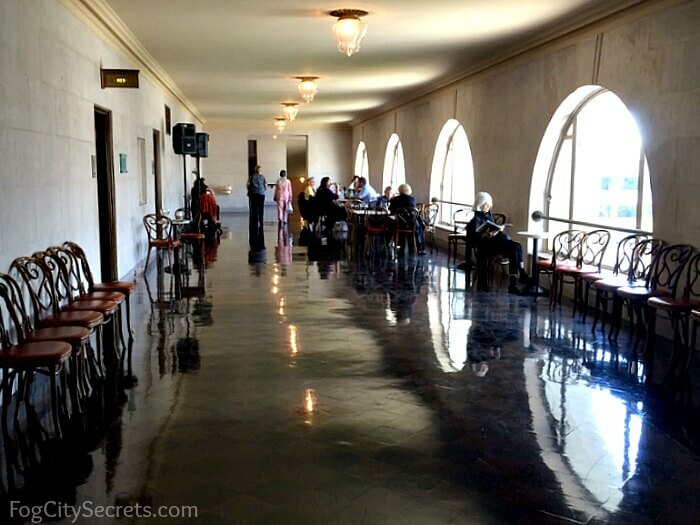 The San Francisco Opera House is located on Van Ness Avenue, near SF City Hall and the Davies Symphony Hall. This beautiful Beaux Arts opera house was built in 1932 by Arthur Brown, the same architect who designed Coit Tower and San Francisco's City Hall. 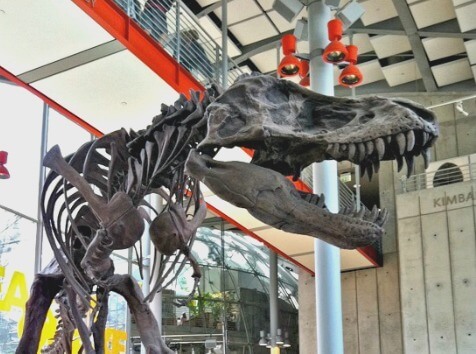 It has seating for 3,146 people, and was retrofitted for earthquakes in 1992, after suffering serious damage from the 1989 quake. Why is it called the War Memorial Opera House? The building and its twin next door were built in part to commemorate the fallen in World War I, in addition to providing a space for musical performances and art. 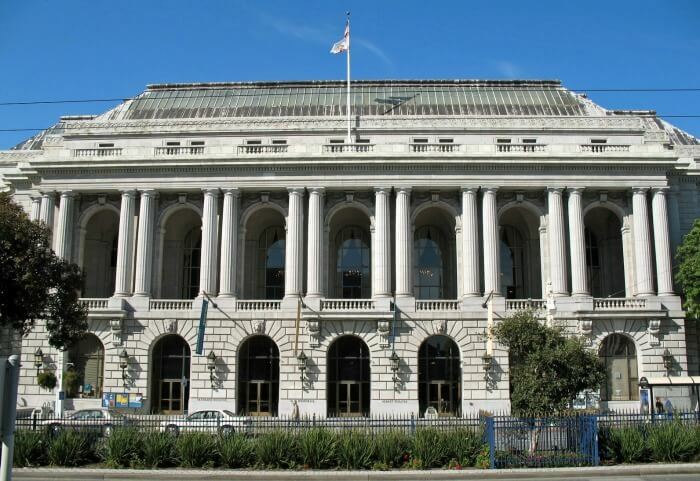 The San Francisco Ballet also performs at the Opera House. The similar building next to the opera house is the Veteran's Building; it housed an art museum until 1994, and now mainly hosts musical performances in its concert halls (the Herbst Theater and a smaller one). The original United Nations Charter was signed here in 1945. On the other side, the modern Davies Symphony Hall hosts the San Francisco Symphony. Opera in San Francisco got its start during the Gold Rush of 1849, and by the early 1900's was staging operas in the Tivoli Opera House (now gone). 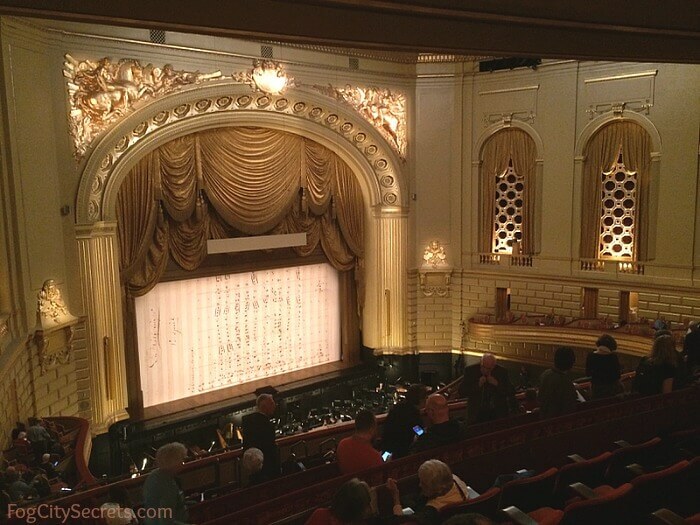 The San Francisco Opera company was officially founded by a conductor from Naples, Gaetano Merola, in 1923. La Boheme was the first opera performed in San Francisco by the young company, and performances were held in the Civic Auditorium until the current opera house was built in 1932. Merola was the director for many years, and actually passed away in 1953, while conducting Madame Butterfly at a free concert in Stern Grove. The tradition of free summer concerts at Stern Grove continues to the present, and one of the summer choices is sometimes an opera. 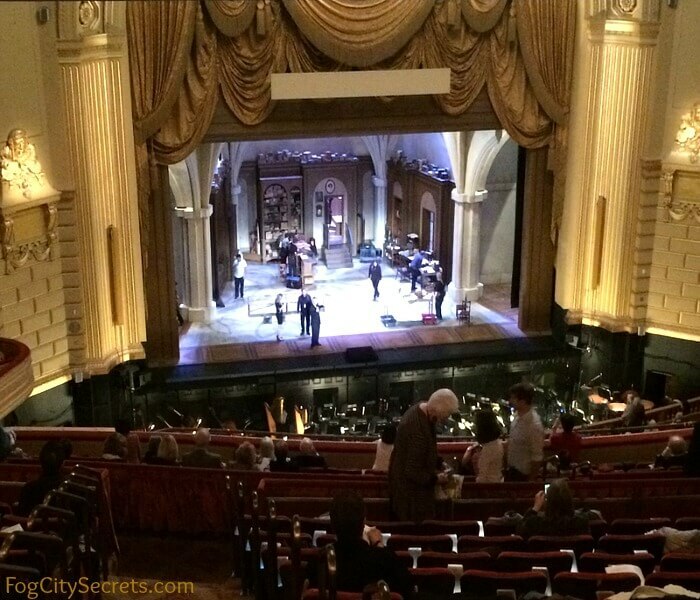 The San Francisco Opera's "season" typically starts in early September and runs through early December. There are usually five operas performed, mostly traditional, but with one or two newer works. Opera tickets in the U.S. tend to be expensive, unlike in Europe, where opera companies are subsidized to make attendance is more accessible. 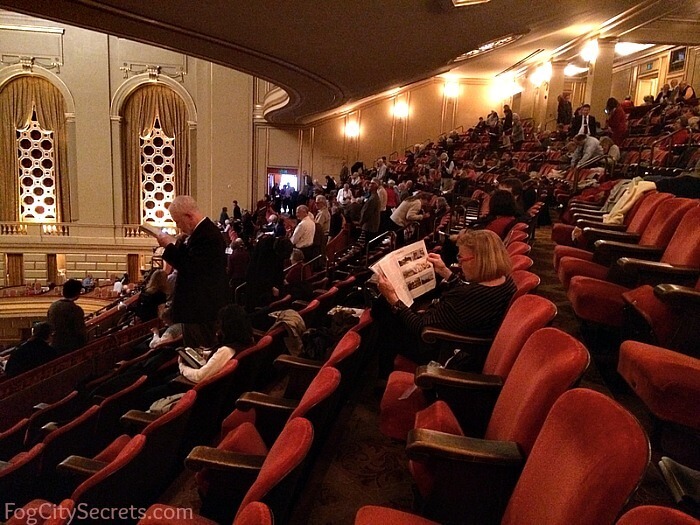 Most seats for the SF Opera, depending on the opera and the location, run between $75 and $370. But there are ways to pay far less. Tip: Best place to get tickets for the opera? Directly from the opera. I researched it for my own tickets, and I found the lowest prices on the SF Opera's own website. Buying tickets. 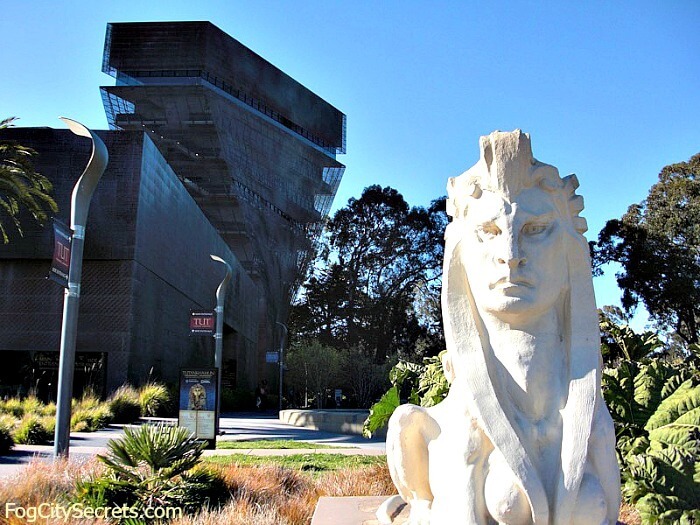 To check out the current operas and book tickets, see SF Opera. You can also book by phone, or in person; call the Box Office at 415 864-3330. Tickets Sold Out? If the event is sold out, or you need two or more seats together and they aren't available, then check ticketliquidators.com. They may have tickets when the venue has sold out, as well as tickets that don't appear on the Opera's website. Yes, you can get cheap tickets. But there's a trade-off: poor views or inconvenient purchasing methods. 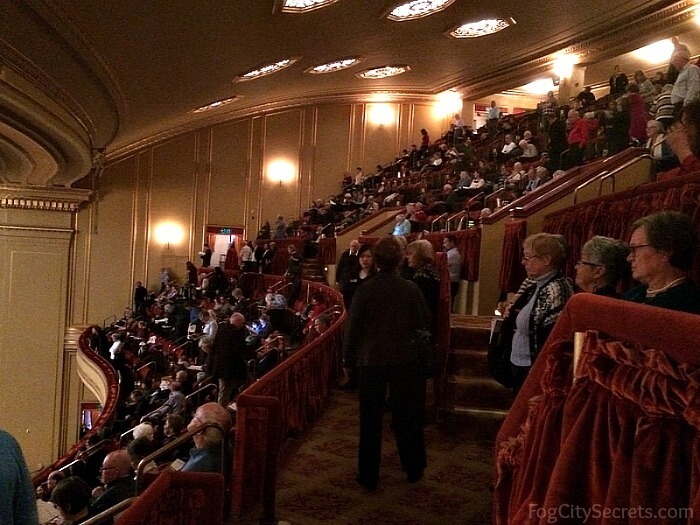 Standing room tickets (at the back of the orchestra section, or up in the nosebleed section) for $10. 200 tickets are available the day of the opera at the box office, starting at 10:00 am, cash only. Limit 2 per person. "Rush" tickets: some performances offer tickets starting at $30-35 for full-time students, seniors 65+, and military members. Same day tickets, starting at 11:00 am at the box office. See available operas. Way up high. The ticket prices drop off drastically at the far reaches of the upper Balcony. As low as $26 for the back 5 rows and far edges. If you're a serious opera fan, you can see the operas for free by becoming an usher, a volunteer position. Small discounts can be obtained via purchasing in person, directly at the opera house ($5 less than online) or by getting tickets for several operas. Naturally, there is a correlation between ticket prices and quality of view. But are the views from the box seats and the Grand Tier that much better than the other seats? I don't think so, especially not for the price difference. When you go to book the ticket, you can click on sample seats and see a photo of the stage view from there. But generally speaking, all the seats in the Orchestra section are quite good, all the way to the back and sides, I think. Ditto for the seats in the Dress Circle. The Balcony seats are pretty far from the stage, but the seats are steeply tiered, so the view is clear, if small. And the acoustics are very good all through the theater. 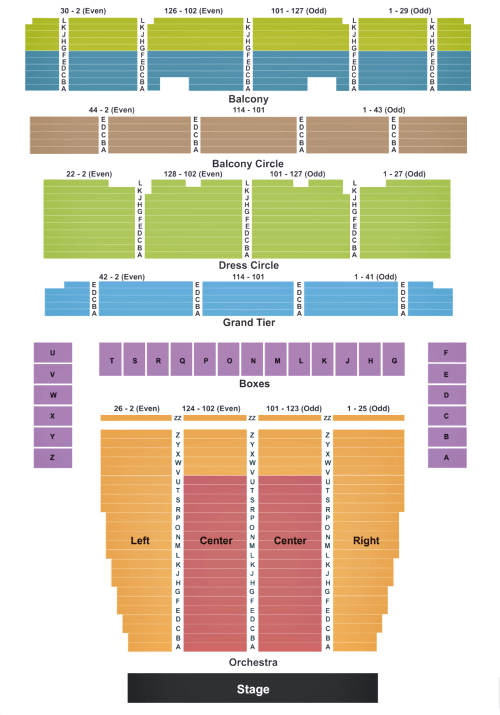 You can get reasonably priced seats to the rear and sides of the Orchestra section. For example, a seat in the center section that goes for $270, is only $91 in the side section, same row, and the view isn't that different. The Dress Circle is somewhat reasonable: $123-$130, depending on the opera. A bit more than the cheapest Orchestra seats, but the entire section (except for the front row) is the same price, so booking early can score the better seats. There is some limited wheelchair seating in the Orchestra and Dress Circle sections. Opera House tours are offered during the season: $20 for a one-hour, guided tour, including behind-the-scenes areas. 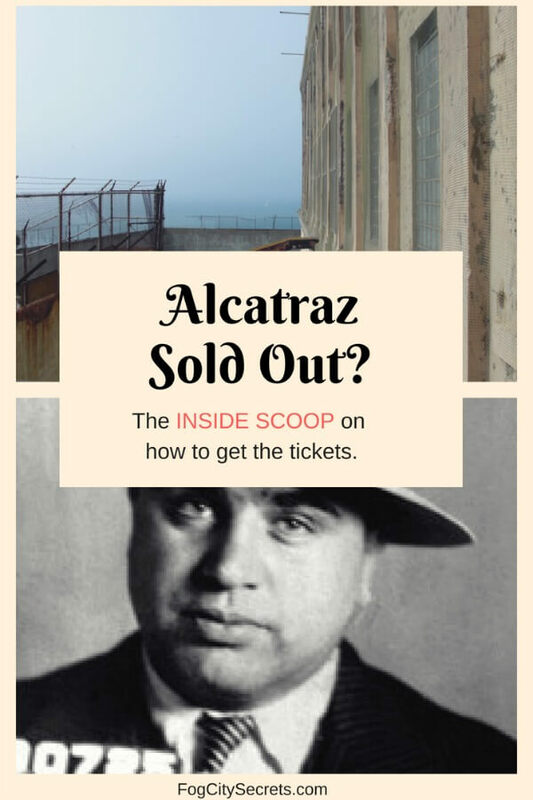 These tend to sell out, so book early in the season to get tickets, at 415 551-6353 or tour.reserve@gmail.com. Pre-opera talks are given 55 minutes before each show, free for ticket holders. Sit in the Orchestra section; you can come and go. They also broadcast the talk on the TV screens in some of the lounges (like the Dress Circle Lounge). Coat check: the seats are rather narrow and close together, so if you have a bulky coat, you may want to check it on the ground floor, on the left side of the building near the lobby. Opera glasses: in case you don't happen to have any lying around at home, they rent opera glasses for $5 on the ground floor near the lobby, on the right side. OperaVision: there are large TV screens in the Balcony section that project close-ups of the singers for certain performances. See the dates for each individual opera. Opera in the Park. On the first Sunday after the Opera's opening night in September, a selection of arias is performed at Sharon Meadow in Golden Gate Park. Stern Grove's free summer concerts. 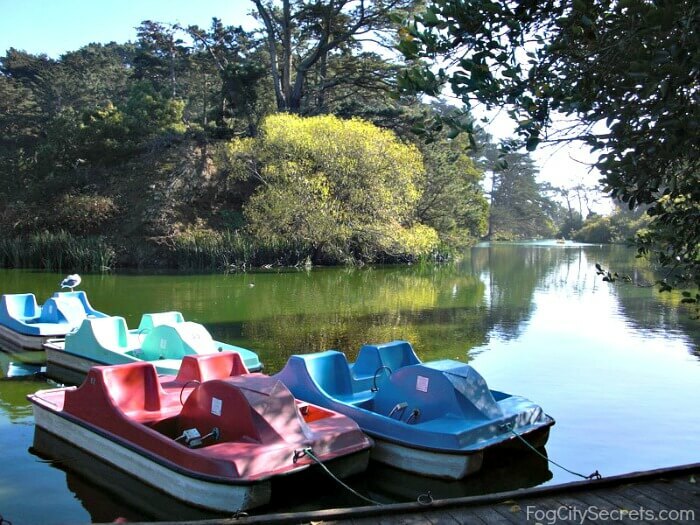 A wide variety of music is performed in a pretty, wooded grotto, entrance at Sloat Blvd. and 19th Avenue. Some years, selections by the SF Opera are included. See the Stern Grove website for their schedule. 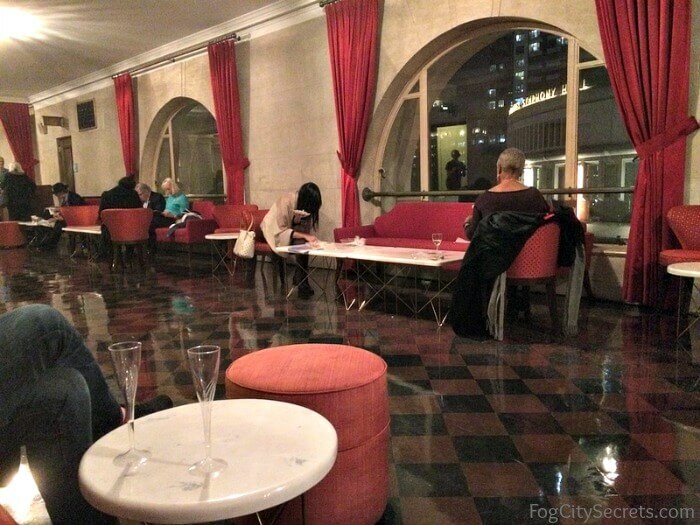 The SF Opera has two dinner restaurants, one on the lower level and one on the mezzanine floor, as well as several bars in the lobby and upper floors that serve drinks and snacks. An outdoor patio cafe also serves refreshments before the performance and during intermissions. You can have dinner before the show at one of the restaurants, and the bars serve drinks and snacks during intermission. This is the largest restaurant, located on the floor below the lobby (Lower Lounge). They open for dinner two hours before the performance, serving a buffet or a la carte items. There is also a bar down there, serving drinks and snacks. Reservations recommended. 415 861-8150. Convenient for opera goers, but not the best location. Unfortunately, it's right next to one of the most popular restrooms for the Orchestra seating area. Before the show, and during intermissions, there's often a long line for the restroom (not the men's, ha ha) running alongside the tables. Nothing to look at in line, other than the folks having dinner! 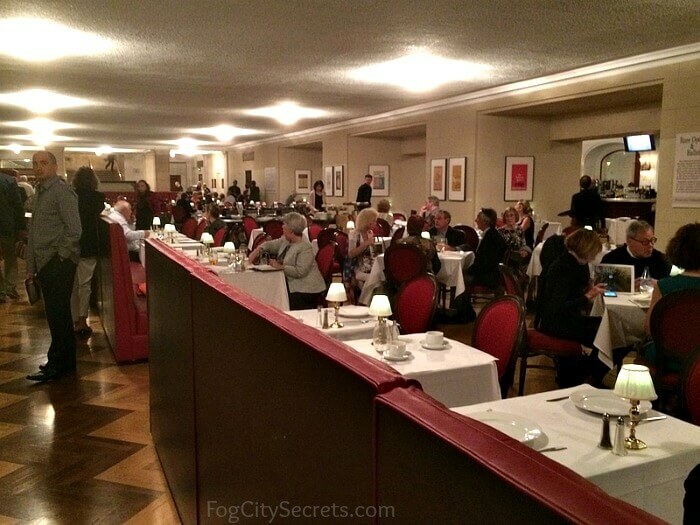 This is a cosy little restaurant on the Mezzanine (Box) level, with a nice view of the lobby, in a more private area. Opens one hour before the show, and during intermissions. Serves a la carte dinner items. Again, reservations recommended. 415 861-8150. There's a bar at one end of the North Box Restaurant, serving drinks and snacks. 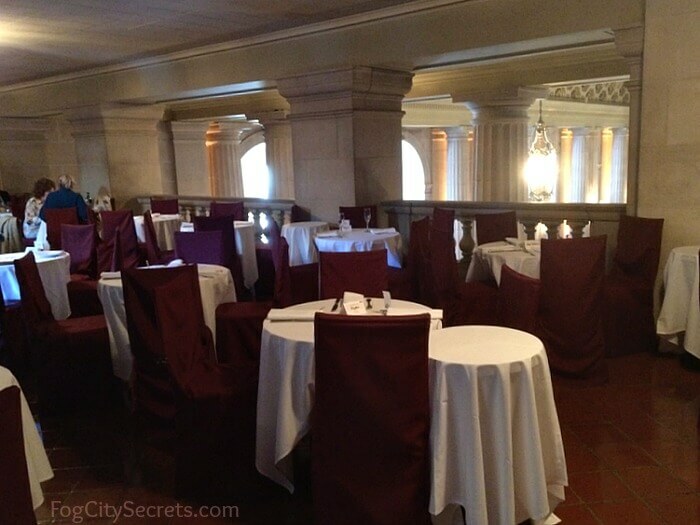 The Dress Circle Lounge serves drinks and snacks before the show, and during the intermissions. It's on the south side of the building, near the Dress Circle entrances. Intermissions are usually about 25 minutes long. The lines at the bars can be long, so it's not a bad idea to order your drinks in advance. You can do that at the bar before the show starts; more time to enjoy your glass of wine or other refreshments. They will put your order with your name on it on the side counter so you can pick it up with no waiting. On the Dress Circle level there is a nice place to hang out with a drink or snack, with comfy seating and a pretty view of the Symphony Hall. It's on the south side of the opera house, near the Dress Circle Lounge and Bar. It fills up quickly, so if you can pick up pre-ordered drinks, you'll have a better chance of getting a seat. It's also a comfortable place to have a dinner snack before the performance. 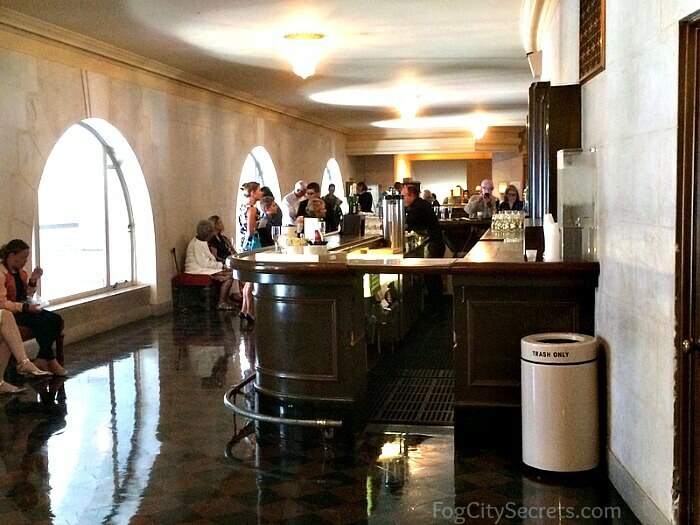 If the bars and lounge areas are crowded during intermission, which they tend to be, you can head over to the other side of the Dress Circle level (north side), where there are chairs to sit down on and some tables that aren't reserved. Restrooms are there, too. For some fresh air, you can also go outside on the Dress Circle level to the balcony, or Loggia, at the front of the Opera House. It's a large covered area with a beautiful view of City Hall. The warning chimes start 8 minutes before the performance resumes. Then two more warnings come at 4 and 2 minutes before showtime. And they do shut the doors to latecomers. 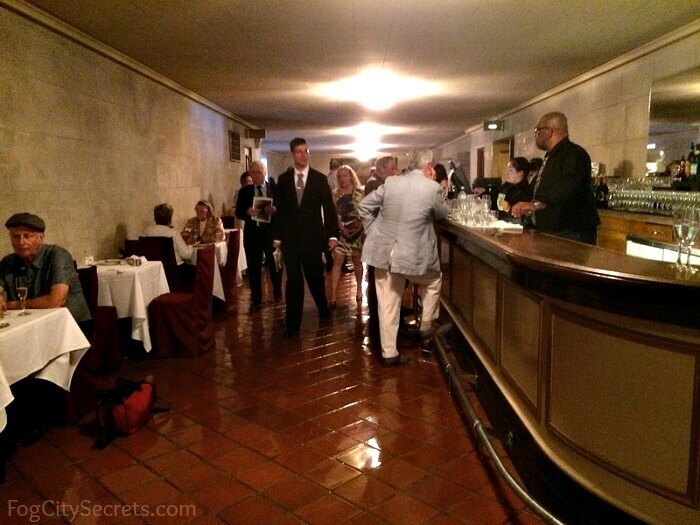 The SF Opera doesn't have a dress code, in the sense that they stop people at the door, but I've been many times and I've never seen anyone in shorts or flip-flops (not that the city's climate would be conducive to that anyway). Most people there are nicely dressed, in business-style clothes or above. Some people are really dressed up, in elegant dresses and black tie, but most are wearing the kind of outfit you would wear out to an upscale restaurant. Nice dresses, or slacks and blouses, for women and nice slacks, buttoned shirts and dinner jackets for men, are typical. A small number of people are very casually dressed in jeans and sweaters or casual jackets. My son wore jeans and a buttoned, cotton shirt last time he went and he felt uncomfortably under-dressed, but others are fine with that. Opening night at the opera is when people really go all-out and fancy. Jardiniere. Elegant, somewhat expensive (unless you have their specialty, the Impossible Burger, at $16). 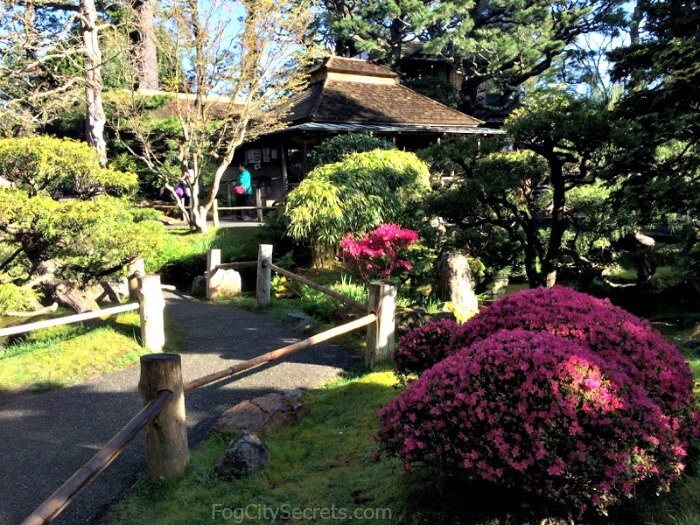 Open daily, reservations 415 861-5555. 300 Grove St.
Little Gem. Fresh, seasonal food. More casual. Reservations 415 914-0501. 400 Grove St. The Hayes Valley neighborhood near the Opera House has a number of good places to eat before the show. This area was dicey 20 years ago, but has gentrified into a charming couple of blocks of interesting shops, cafes and restaurants. Hayes Street Grill. A 40-year San Francisco tradition. Classy seafood restaurant, old-time atmosphere. Open for dinner daily. Reservations 415 863-5545. 320 Hayes St.
Absinthe Brasserie and Bar. Great cocktails and expensive dinners, turn-of-the-century France ambiance. Reservations 415 551-1590. 398 Hayes St.
Arlequin Cafe. More casual dining, less expensive. Burgers, sandwiches, pizza and salads. 384 Hayes St.
A really fun place to go for drinks is a just couple of blocks from the Opera as well. Smuggler's Cove is a wild, Tiki-style bar that has been on many "best bars" lists nationally and internationally. You'll see why if you go there. They specialize in exotic cocktails, and have over 550 different rums to choose from. It's fairly small and they don't take reservations, so there could be a line, especially on weekends. Spend an hour or so with the Pirates of the Caribbean! Warning: they don't serve food. 650 Gough St.
A lot of people drive to the opera, since there are plenty of parking opportunities within a short walk of the building (and the nearby BART stations aren't in the best areas for late-night walking). Many opera-goers park in the Performing Arts Garage, which is just behind the Opera House at 360 Grove Street. $20 flat fee on performance days, cash much preferred (can be a big hassle without cash). This isn't the greatest area at night, but after a performance there are lots of people walking to the garage, and inside the garage, so it feels pretty safe. Tip: go early to get a spot and avoid the long line of cars waiting to get into the garage. The performances usually begin around 7:30 pm, so get there before 7:00 if you can; 6:45 is even better. Once I got there a bit after 7:00 and the garage was full. Impark Garage. 601 Van Ness, two blocks up Van Ness from the Opera House. Valet parking. Hasting Law School Garage. 376 Larkin St. About three blocks from the Opera House. Civic Center Garage. About two blocks from the Opera House. This is a huge, underground parking garage in front of City Hall, entrance on McAllister Street. It's got plenty of spaces, and is a good daytime solution, but at night it doesn't have security inside, other than at the entrance. I would rather park at the Performing Arts Garage at night. They do have some great discounts for some of the performances, though: $5 flat fee for performances on Nov 4, 10, 16, 18, 24, 25; Dec 2, 6, 7. Reserve a parking spot. 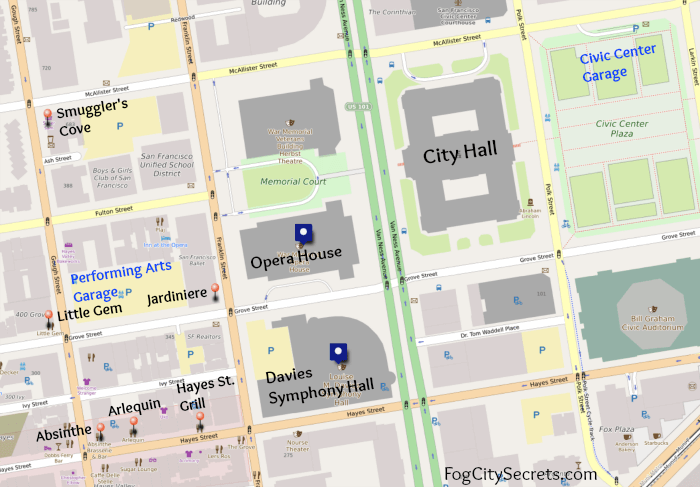 The popular garages in the area can fill up on evenings when the opera is in session, especially when there's also a program happening at the nearby Davies Symphony Hall. For a sure thing, you can book a spot in advance through the app Spot Hero. Neither the Performing Arts Garage nor the Civic Center Garage take reservations, but there are other garages and parking lots in the area that are bookable. The SF Opera House is on several bus lines that have stops close to the building. Bus lines 47 and 49 run down Van Ness and stop in front. Bus line 21 runs down Grove and Hayes, right past the opera. Bus line 5 runs along McAllister, one block away. See Muni map for bus routes. The Muni Metro (streetcars) has an underground stop at Van Ness & Market Streets for six lines: J, K, L, M, N & T.
The Muni station is 3 blocks down Van Ness Ave. from the Opera House. The closest BART station is Civic Center BART, three blocks from the Opera House. The entrances to the underground station are at 8th & Market St. I'll be blunt; 8th and Market is in a bad area. It's sketchy during the daytime, never mind after dark. People do take BART to the opera, but I wouldn't feel comfortable walking to that BART station at 11:00 at night, dressed for the opera, then going down into the station and waiting for a train. It's a matter of personal preference, of course. But for people who aren't that familiar with the city, I think it would be good to know, so they can make the choice. SF Opera shuttle: the opera now provides a free shuttle from the opera to the Civic Center BART station. The shuttle runs for 90 minutes before and 45 minutes after each performance. The pick up and drop off point is in front of the Burger King at the corner of Grove and Hyde, near 8th & Market. The entrances to the BART station are across Market Street from the Burger King, or in the next block up from it. 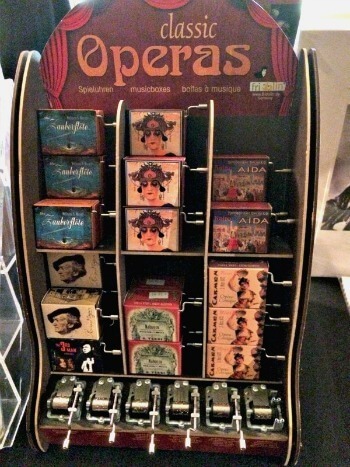 The SF Opera has a nice little gift shop on the Mezzanine Level. 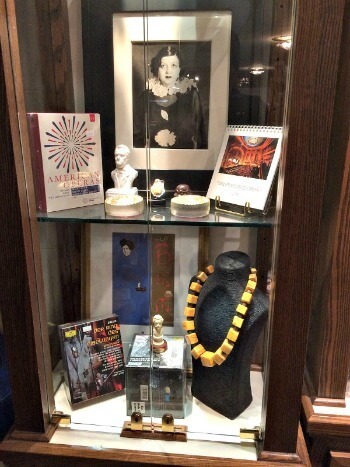 They have various opera-related items like books, DVD's, CD's and t-shirts, plus some designer jewelry. My favorite thing: posters designed just for this season's operas. You can pick up some attractive, unique wall decorations here, at a reasonable price. They have an online shop as well, but the posters are usually sold out when the season is over.